How advanced is your sales automation? . ACCUEIL / BLOG / HOW ADVANCED IS YOUR SALES AUTOMATION? The advances in functionality of marketing and sales automation tools over recent years offers many new capabilities for integrating the sales funnel, which were simply impossible to scale without automation. The automatic collection, qualification and grading of leads enables your sales team to be far more efficient, and spend more of their time on what matters: talking to potential clients and convincing them of the value of your services. Yet, in my experience, although important, selecting the best functionality in a sales automation service is not the main determinant of success for when it is deployed in an organisation. Rather, success will be based on how many of the automation features will be deployed and how well optimised they are across prospect touchpoints in the sales cycle. This is why it’s important to regularly review the sales automation capability of your business and more importantly your plans to improve it to better qualify and scale your pipeline. In this article, I’ll show you how to review your capability with the aid of one of 5-point scale capability benchmarks we have developed at Smart Insights. 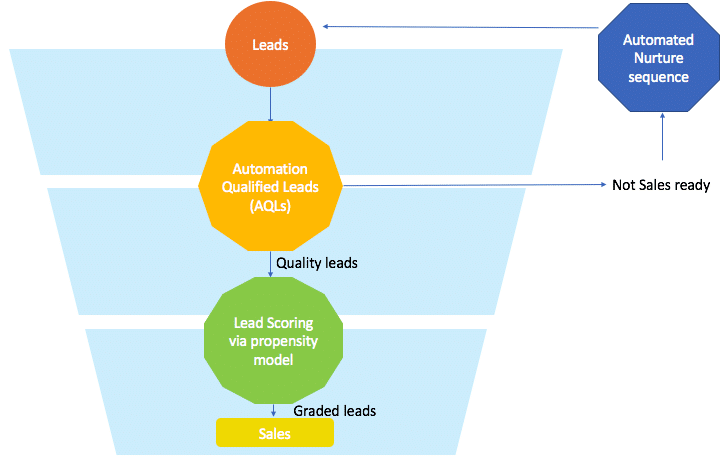 The visual below summarises, at a basic capability level, how sales automation tech can be used across the sales funnel to assess the quality of leads and score them. This improves efficiencies by preventing the sales team wasting time calling people who are unlikely to want or need the kind of services you provide since their organisation is a poor fit for your services. Automation Qualified Leads are the ‘entry level’ of sales automation capability based on profile fit such as type, sector and size of organisation, plus the role and interest of the individual. These profile details are simply collected when disclosed by the person subscribing when interacting with a company online to attend a webinar or to download a relevant lead magnet whitepaper. Fit is usually assessed on a scale of A to to G of lead grade based on these profile characteristics. To understand interest and propensity lead scoring models are run based on the type and number of interactions. For example, a prospect who has consumed bottom-of-funnel content like ‘how to buy’ or feature specifications is a higher potential lead than one who has simply consumed top-of-funnel leads. So far, so simple, this is the basic level of capability and there are many nuances in a real-world sales process. 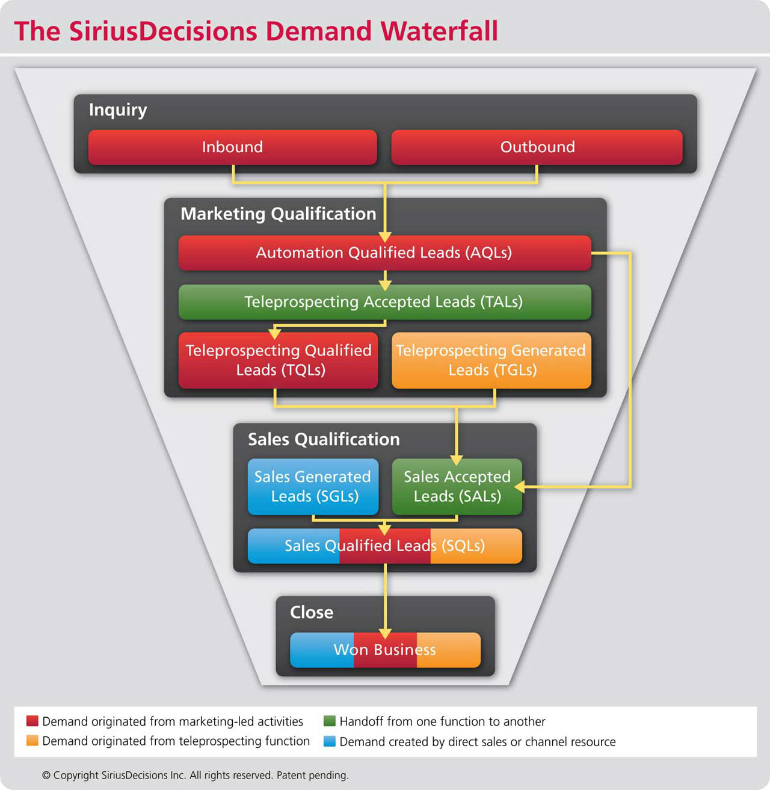 For a more complex and in-depth understanding of how sales automation can be utilised across the sales funnel, see the SiriusDecisions Demand Waterfall™ model. Within sales automation, there are also many levels of complexity based on the types of scoring and follow-up ‘sense and respond’ email marketing and personalisation used for lead nurturing. Let’s now look at a practical way for you to score your capability. You are almost certainly already using sales automation techniques to some degree, but these may not be well integrated. Or you may have successfully integrated but are not using the latest techniques. Using the Smart Insights capability grading technique I designed can help here, by letting you assess your business’s current abilities, and by showing you what you need to put in place to develop a better sales automation process. Here’s an example for marketing and sales automation. The link above explains how we apply the Carnegie Mellon 5 point scale of capability benchmarking used in many industries. As you can see, column 1 is the entry level with 5 best-in-class. 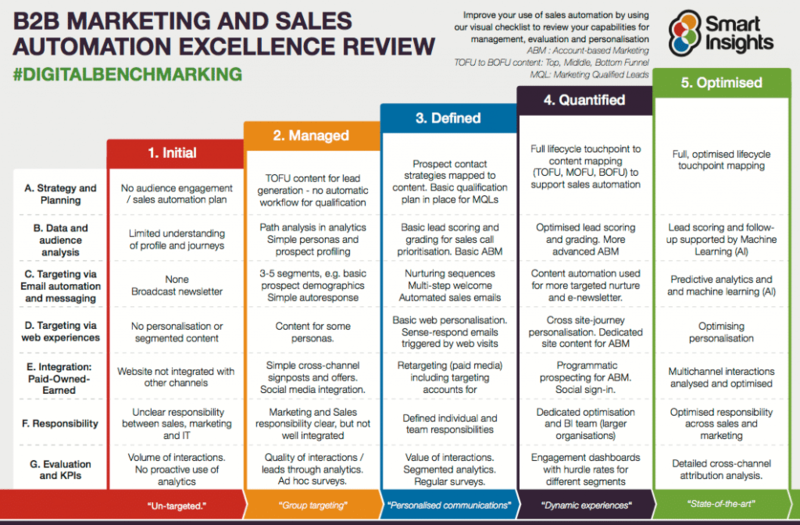 Each row shows the different capabilities you should consider when trying to improve your sales automation. For many level 3 is a good competent level to aspire to. 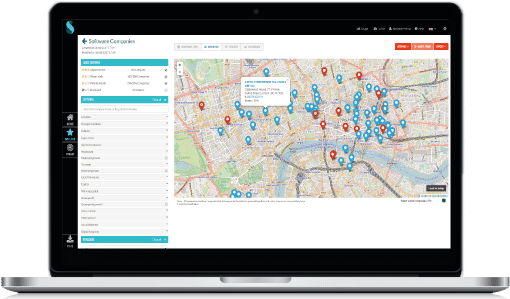 We’ve broken out how you assess your automation capabilities into Strategy and Planning, Data and analytics, targeting via email automation, targeting via web, integration, responsibility and evaluation. In the next sections, we will set out how you can improve how your sales automation process across these categories. To create a successful strategy for managing sales automation, you need to develop a contact plan that covers the whole customer lifecycle. By first designing how you interact with prospects using different types of content to support the decisions of different personas you then put the customer at the heart of your strategy. This avoids the classic error of creating a strategy that looks great on a Powerpoint deck but fails when put into practice because it bears little resemblance to the experience of the customer and hasn’t been mapped in detail on a spreadsheet. To achieve this you need to research your audience and discover what content would be most useful to them. You can use this knowledge to create TOFU (top of funnel) content designed to draw in readers and get them to sign up and thus generate leads. Industry specific white papers and practical ‘how to’ guides are perfect for this. Develop detailed target customer personas to help you create the perfect content to help them in their roles. By doing this you will ensure greater demand for your content and thus get more leads into the top of the funnel. 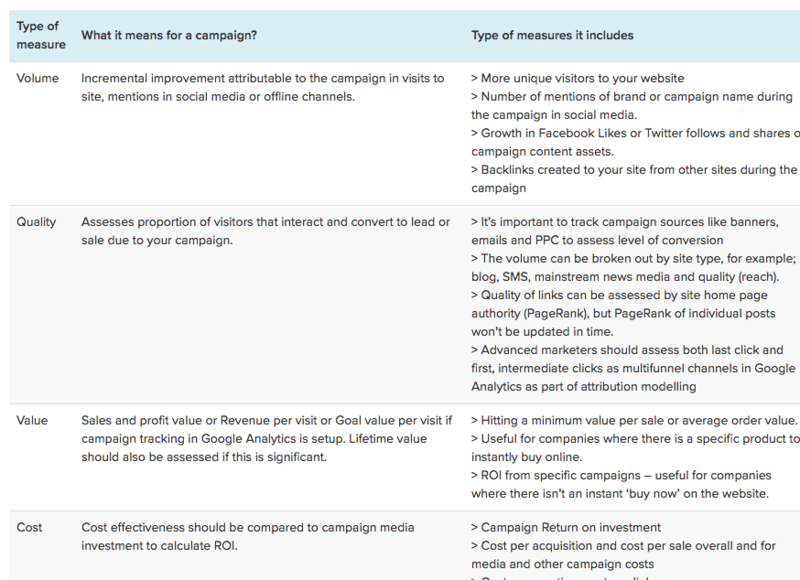 Of course, you will also need to set up lead scoring and grading across the funnel to established MQLs, as outlined at the start of this article, to pass to sales. It is crucial you have the right data to be able to accurately qualify prospects. Start by gathering essential information such as job role, company size, type and sector. You can then match this data with what prospects have downloaded or interacted with on your website, and build up a picture of what services they require and will be interested in purchasing. At a more advanced capability level you can also use machine learning techniques to create accurate propensity models, which let you make accurate predictions of which leads are mostly likely to convert and when. This can let sales use highly targeted calls to only the hottest leads or improve pipeline velocity by contacting these prospects earlier. At higher capability levels, businesses looking to target larger clients should also be using account-based marketing, and should build this into their data architecture. This means accounting for the fact that there will be multiple stakeholders who need to be engaged, so the sales team are likely to be talking to several decisions making members of a target organisation. Using paid media to target these decision makers, for example in LinkedIn can make the conversations smoother since they can increase familiarity with your services before the call. These are crucial sales marketing activities used for automated email marketing to deliver content and relevant nurturing messages to prospects from marketing and sales. Interactions with these emails and the content contained will help with lead scoring and grading. Automated nurture sequences specific to the prospect’s industry or sector can help bring leads from those which are merely interested to ready to purchase. More advanced businesses should be using personalisation via dynamic content to insert copy or offers tailored exactly to the individual respondents. Propensity models can also be used to assess what stage the prospect is at in the buyer’s journey and tailor content accordingly. Deploying personalised messages on site can also help drive prospects down the funnel to nurture towards conversion. At the most basic level, these can be delivered by push notifications, which do get good levels of engagement. For the more advanced, consider crafting customised customer journeys and creating dynamic web content which displays to those who have mentioned their interest in a particular aspect of your product/services. By focusing your online presence on what the customer is interested in, you can significantly increase your conversion rate. Integrating across channels is key to further optimising results. By using data gathered on-site to deliver relevant and personalised re-targeting ads via Google, Facebook you can re-engage prospects that have demonstrated interest but have not re-turned to the site. This can help stop you missing out on huge quantities of business. One of the main challenges with sales automation, is that it is often unclear where marketing automation ends and sales automation begins. In addition, both areas are very technical thanks to the complexity of some of the techniques (CRM integration, retargeting, machine learning and propensity modelling, for examples) so may also come under the responsibility of IT. This means you need to define responsibilities clearly, whilst also facilitating all three departments to work extremely closely together. To become more advanced in how you evaluate the success of your sales automation program, you need to move away from just focusing on ‘volume’ metrics, like number of downloads etc., and move to a more holistic picture by putting in place VQVC metrics. By improving your sales automation approach across all seven of the capability areas set out in this article you will dramatically increase your ability to augment large parts of the sales process with automation. This will let your sales team focus on doing what they do best: sell. Dave Chaffey is CEO and co-founder of Smart Insights. Dave is author of 5 bestselling books on digital marketing including Emarketing Excellence and Digital Marketing: Strategy, Implementation and Practice. In 2004 he was recognised by the Chartered Institute of Marketing as one of 50 marketing ‘gurus’ worldwide who have helped shape the future of marketing.